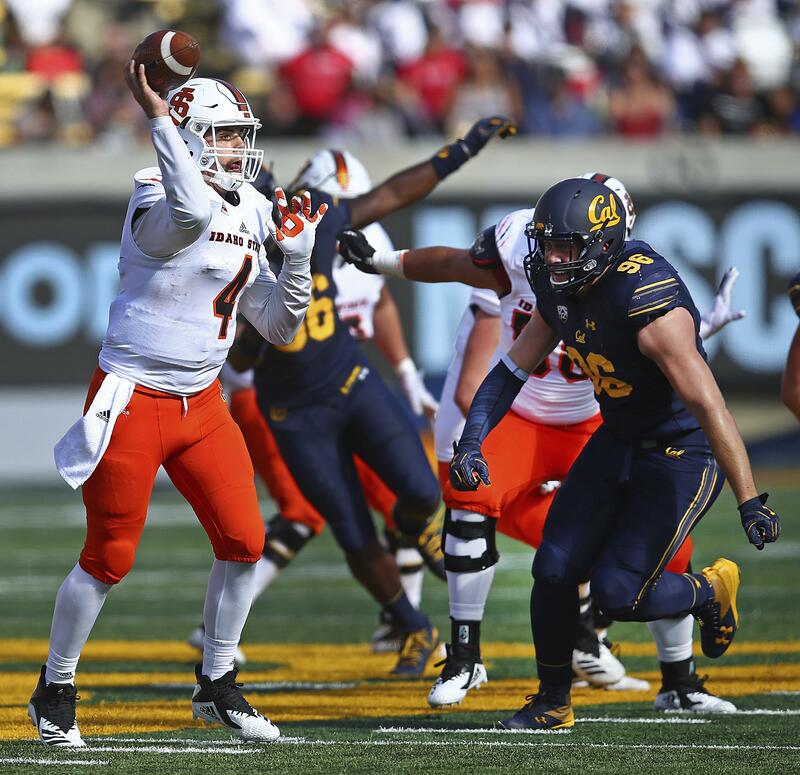 POCATELLO – Hearkening back to an old-fashioned Big Sky Conference scoreboard-challenging shootout, Idaho and Idaho State resumed a rivalry dormant since 2008 with an exclamation. The Bengals set a single-game touchdown passing record in a 62-28 win against Idaho at Holt Arena. Tanner Gueller threw for eight touchdowns and 492 yards, although the Vandals hung around through the third quarter, drawing as close as 41-28 with 5:25 to play. “We couldn’t cover them and we couldn’t get a pass rush,” Idaho coach Paul Petrino said. “We played zone and they picked us apart. Gueller, a senior, broke the ISU single-game record of six passing touchdowns that had been shared by two players. He also rushed for 81 yards. Michael Dean caught four Gueller touchdowns among his six catches for 150 yards. Tight end Austin Campbell caught a pair of touchdowns from Gueller. Mitch Gueller, who led the Bengals with six receptions for 184 yards, was also the recipient of a scoring pass from his brother. Tanner Gueller averaged 25.9 yards per completion. In the loss, Idaho may have taken a step toward finding a starting quarterback. Mason Petrino and Colton Richardson had been sharing the position, but Richardson found a rhythm in the second half and played most of the final two quarters. Richardson completed 13 of 20 passes for 191 yards and two touchdowns, with an interception. Petrino was 11 of 22 for 81 yards. He rushed for 40 yards. Senior David Ungerer led Idaho receivers with 10 catches for 111 yards. The Vandals had their most notable success moving the ball on the ground. Isaiah Saunders rushed for 144 yards on 19 carries. Tyrese Walker added 89 yards on 14 carries, with a touchdown. After opening the scoring in the first quarter with Mason Petrino’s 7-yard dash around the right corner, the Vandals fell flat. Idaho State scored five of its touchdowns in the first half. Campbell raced by Idaho’s linebackers, who were fooled on a run fake, and he and Gueller connected on an easy pitch-and-catch for the Bengals’ first points. Dean launched himself past Vandals safety Jalen Hoover and at the same time twisted in the air and reached behind to grab a 14-yard pass in the end zone and give the Bengals the lead. Gueller found his brother Mitch in single coverage from Idaho cornerback Dorian Clark and hit him with a 29-yard strike to push the score to 21-7. When Demonte Horton got free from Idaho’s Tevin Duke and Denzal Brantley in the secondary, Gueller hit him in stride over the middle, and Horton ran 87 yards to the end zone. The Vandals finally answered. After overthrowing tight end Ashby Harrison, Richardson got into a rhythm and completed two passes. Saunders probed the left side of the Bengals’ defense for a first down, and Richardson hit Connor Whitney with a 22-yard strike over the middle for a score. But the Bengals came right back with a 62-yard pass from Gueller to Dean, who stepped through Clark’s ankle tackle and headed to the end zone. Later, James Madison’s 7-yard scoring run, in which he broke through two Vandals tackles, gave ISU a 48-28 lead. A 4-yard slant to a diving Dean widened the margin to 55-28. On that play, Gueller set the ISU single-game record for passing touchdowns with his seventh. Published: Oct. 6, 2018, 7:18 p.m. Updated: Oct. 6, 2018, 8:39 p.m.